Providing fun and laughter since 1996! NEW >>> Join our Mailing List! Send a Valentine’s Day Gift in Style! Available only on February 14th. This incredible package includes a dozen roses, a $25 gift card, and a song from a great barbershop quartet! Call 203-846-2000 to book now! A smile. A laugh. A special moment that will brighten someone's day. Nothing beats the smile on a face when they are greeted with balloons on their special day. Remember the birthday, the anniversary or the promotion. 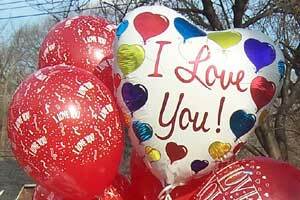 What ever the occasion, balloons are always a nice way to say "I'm thinking of you!" From the simple balloon drop off to a home in Darien or Greenwich, to characters, mini shows and singing telegrams created just for that special person delivered to the office in New Canaan, Stratford or Trumbull, Party Talent, LLC. 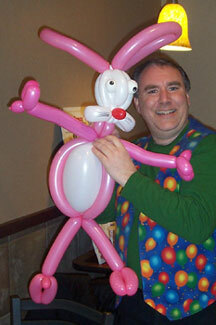 Party Talent has a singing telegram, balloon delivery or show for you. Traveling all over Fairfield County and beyond, from the popular Gorilla Gram, bum or Hairy Fairy Godmother, Mr. Bungles has the right character to make them smile! "Thank you for making Dawnzie's 40th Birthday! She and her office staff found you hilarious! They are still talking about it." "Everything went AWESOME! Your character was perfect. You totally caught everyone off guard and it worked out really well! The song was hysterical!...Thanks again for everything! You helped to make Tim's party a great success!" "Daniel truly enjoyed the gorilla-gram. Thanks for fitting him in to your busy schedule last minute! It went really well!" 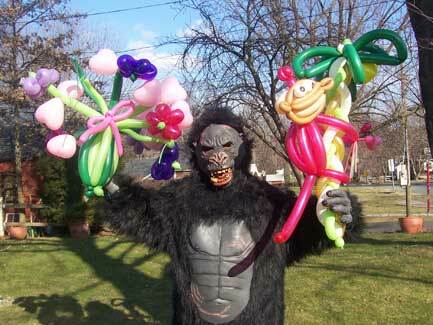 There are many different types of singing telegrams and balloon deliveries available. The standard singing telegram package includes a beautiful bouquet of balloons, professionally presented without costume, and hand delivered with your personal message (only $65.00 for local deliveries). 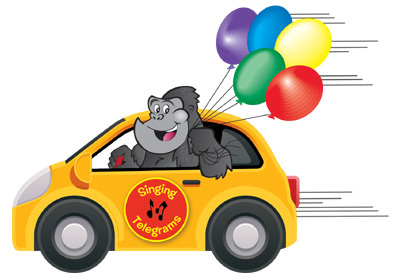 If you want your singing telegram to be something more than the professional balloon delivery choose the singing telegram show which includes the comedy of Mr. Bungles, or a gorilla, monk, Hairy Fairy Godmother, Angel, bum and a variety of other characters to make your singing telegram unforgettable. Gorilla grams and other characters create a wonderful funny memory. All singing telegrams include a beautiful bunch of helium balloons for any occasion and twisted balloon sculptures. You can write a personal song that will be sung, add flowers, and create almost any kind of scenario you can imagine. "My brother thought it was hilarious and embarrassing! Thank you." "Thank you so much for adding to Neal’s birthday celebration- you did all we could have hoped for." The ultimate singing telegram or gorilla gram involves the above performance and a special song created just for your singing telegram. After discussing, hobbies, work, funny habits, and great stories, a surprise song is written and presented as part of the singing telegram delivery to make it extra special. (Note: because of preparation involved preparing song, a minimum of 4 days is required for this option). 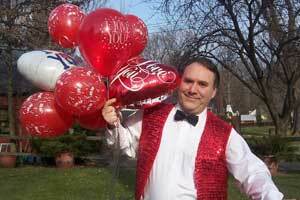 Customize your singing telegram or balloon delivery! "The singing gorilla was wonderful!!! He was energetic, funny, and completely in character! He worked with our time schedule without any issues, very accommodating. The amount of balloons was insane, and the costume looked great. Our entire office got a lot of laughs. Thank you!" What is your idea? A hopping frog? A wild gorilla? A dozen roses? Or a special bouquet of hand made balloon flowers arranged as a wonderful centerpiece? 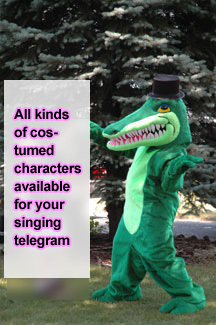 You can customize your singing telegram and balloon delivery with any costume that you like and choose the gorilla gram or any other character that works for you. Simply call 203-846-2000 for price information. 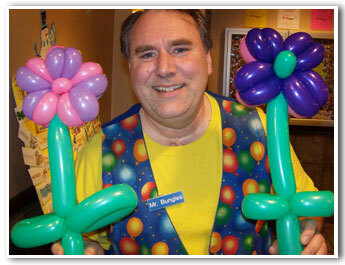 We'll work within your budget to create the perfect singing telegram and balloon delivery that will make them smile! After reviewing all the details, and selecting the singing telegram options that work for your budget, payment can be made by credit card, check or cash. Checks should be made payable to Party Talent, LLC., LLC. For more details on ordering click here. Get ready to have some singing telegram, gorilla gram and balloon delivery fun!